Note:* Only put the NUMBER in the box. Example - for 32ft please put 32 only. 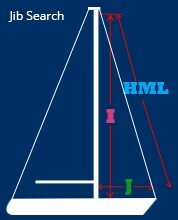 "Headsail Max Luff" is measured from jib halyard sheave to the tack shackle or horn. For a furling system, measure from the sail attachment points when the system is fully raised. "I" is measured from the top of the jib halyard sheave to the deck (actually the sheer line). "J" is measured from the front side of the mast to the intersection of the deck and head stay. 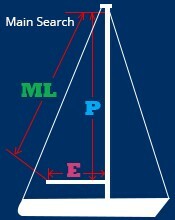 "P" is measured from the main halyard sheave to the main tack fitting "E" is measured from the main tack fitting to the "black band" at the end of the boom. "Main Leach" is measured fro the main halyard sheave to the "black band' at the end of the boom. "I" is measured from the top of the jib halyard sheave to the deck (actually the sheer line). A sail measuring +/- 10% is an acceptable fit. 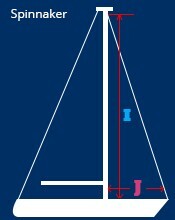 "J" is measured from the front side of the mast to the intersection of the deck and head stay. 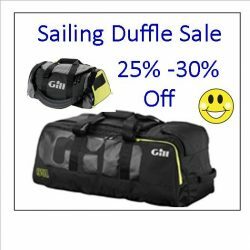 Click here to browse through our storm sail selection.